Tips: In some cases, the system environment is more complicated, we hope to get the complete call information, then we can use tcpdump access to network data, the use of wireshark for further analysis. 2、The capture command is executed and the captured information is saved in a file. Indicates that packets received by any network interface are saved to the internal.pcap file. 4、After the implementation of the system will stop here, this time we can make a phone call, and then use “Ctrl+c” to end. Tcpdump will output some capturing packet information, so tcpdump’s mission is complete, download the pcap file and turn the wireshark. 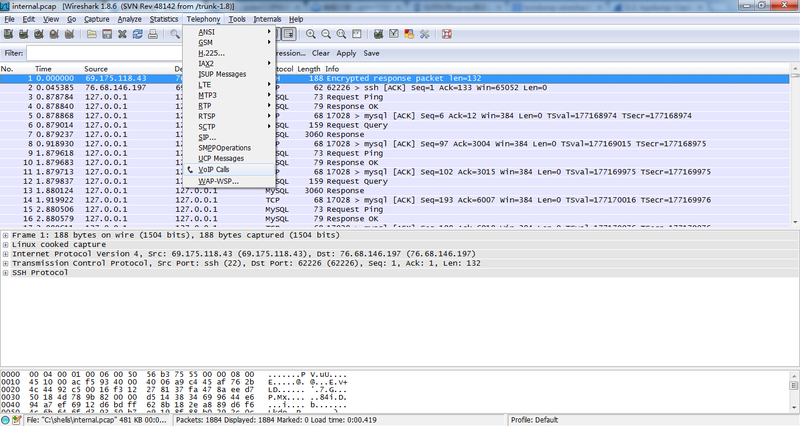 5、Wireshark can download from http://www.wireshark.org/download.html，install and run wireshark, then open the internal.pcap file. Here we can see tcpdump caught a variety of packages, the use of “Telephony” under the “VoIP Calls”, the system will automatically summarize during the call. 6、Select a call, click the Flow button, wireshark will use a graphic to represent the call, click the appropriate steps, we can see the corresponding IP packet information.